Larchmont heiress Mrs. Katherine (nee Murray) Allen spotted a diamond bracelet on her husband’s client’s wrist one evening at a posh NYC night club and took it from there with private gumshoes on the trail. Returning home from a Florida trip in late February 1928, the sheets on Mrs. Allen’s purple-canopied bed seemed amiss. Someone had been sleeping in Momma Bear’s bed. Six nights, in fact. Suit was commenced forthwith in White Plains, and the rags went nuts. The legal spat was postponed until November but by the end of the winter, the Allens were no more. Score another for Peaches: what’s a girl to do? 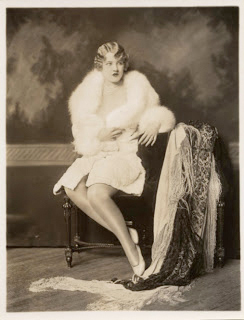 She’d remain married to Daddy Browning until his death in mid-1934. At age 23 she became free as a bird, and quickly, quickly made up for lost time, marrying and divorcing three more times before her untimely, booze-soaked death in 1956. 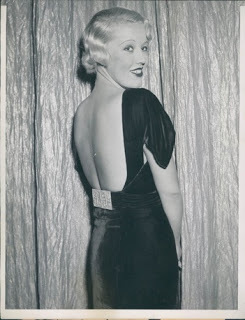 Along the way her golden image never failed to attract the attention of the scribes. 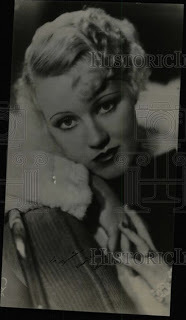 Here she is in 1934 and 1936, the second photo inscribed by her to her husband, Denver theater operator Bernie Hynes. Who know how many guys got nailed in between. Bravo Peaches, and take that Daddy Browning, you gallus old codger. Think Pete in Mad Men hitting on the 17-year old in driving class. Double Pete’s age and swallow hard.